On a sunny and windy Palm Sunday morning in 1908, a smoker casually dumped his pipe's hot ashes near an open lot used to dry rags at the corner of Second and Carter streets. That's one theory. Another points to a group of mischievous kids causing trouble. Or maybe it was a greedy business owner with his sights on insurance money. It might have even been the result of spontaneous combustion at the rag dump. In a city defined by a history of massive fires, including an 18-city-block blaze in 1973, no one knows what sparked the Great Chelsea Fire of 1908, which took 19 lives and leveled nearly half the city on April 12 of that year. "To this day, no one knows the exact beginnings of it," said George Ostler, president of the Chelsea Historical Society, which organized the fire's 100-year commemoration this Saturday from noon to 4 p.m. at the Chelsea Public Library. "It was really disastrous to the people that had to live through it." Residents had mere moments to flee fast-burning structures, bundling anything they could salvage in bedsheets and dodging flaming debris and embers carried by the strong winds as they made their way toward Revere. Many escaped with just the clothes on their backs, like congrega tion members of the People's Afro-Methodist Episcopal Church on Fourth Street, who were in the middle of a service, unaware that the church's roof was on fire. Only 20 minutes after the pastor and the congregation evacuated, the building burned down. Modern technology and fire equipment would likely control a fire like the one in 1908, which spread for five hours and burned 492 acres in approximately 10 hours, Ostler said. 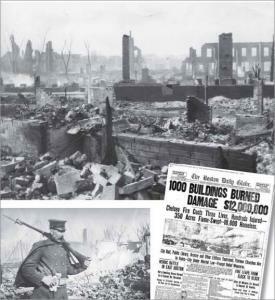 The fire burned 2,822 buildings, including City Hall, the library, and the central fire station. Thirteen churches and three synagogues were destroyed that day, on the eve of Passover. Fire Chief Chuck Fothergill, said Chelsea is prone to rapid-spreading blazes due to the combination of high winds and turn-of-the-century wooden architecture. "Could a fire like that happen today? Sure," Fothergill said. "For one thing, you have an LNG tanker that comes in and turns around at the mouth of the Tobin Bridge and goes into Everett. If you have a release of the LNG, you could see a devastating fire. We also have densely populated neighborhoods in Chelsea, a lot of it still with construction from that period from the late 1800s and early 1900s . . . so you still have those kinds of conditions." Today's single-engine pumper can release up to 1,500 gallons of water per minute, compared with 1,000 per minute in 1973, and between 300 and 600 gallons per minute for the horse-drawn, hand-powered steamer engine of 1908, Fothergill said. "It took an enormous amount of manpower, between eight to 10 men, to operate the hand pump for the water, and another three or four guys to apply the water," Fothergill said of firefighting in 1908. Chelsea's Fire Department was 78 strong in 1908 and had three steamers in service, plenty of power to control the small fire that started at the rag dump, but no match for the wind that fueled the rapid destruction, Ostler said. Firefighters had the junkyard fire under control, but the wind hurled flaming rags two blocks away to the roof of the Boston Blacking Co., engulfing it. Suddenly, rags inside two tar paper companies near the junkyard set the buildings on fire, with heat and flames so strong that a nearby shed full of gasoline exploded. The fire then spread toward the creek, causing about 23 tanks to explode at three oil companies, Ostler said. East Boston also felt a sting from the fire, after flying embers managed to burn the roofs off about 50 homes there. John McCarthy, 76, a former manufacturing supervisor and now a consultant at Chelsea Clock, one of the few businesses from that period that are still active, said through a company spokeswoman that his mother would later tell him that she could see the sky over Chelsea turn bright red from her home in East Boston. Ostler's grandparents and their nine children, including Ostler's mother, who was 16 at the time, lost everything in the fire. Ostler's mother would later tell him that she was able to grab bundles of baby food and other necessities for her 2-month-old sibling but that as she escaped, flying embers landed on the bundle she was carrying, setting it on fire. Her father, who was working that day, would not see his family for two days as he was forced into East Boston by the militia, who'd been called in to protect the city and keep people away. Despite the magnitude of the destruction, it would only take the city about 2 1/2 years to rebuild and five years to surpass the extent of 1908's infrastructure, Ostler said. The city was also laid out differently after the fire, with wider streets and more access for emergency vehicles, he said. City officials also decreased the number of permits they allowed for rag shops. Ron Robinson of the historical society said the disaster brought strangers together. Those whose homes were left intact welcomed the homeless. One of those who opened his doors was Alderman William J. Williams, an African-American who took in many of the city's black residents, Robinson said. Residents from around the state poured about $360,000 in donations into the city, contributing to its speedy recovery. Without being asked, officials in Revere, where hundreds of refugees found themselves, sent members of their street department to Chelsea the next day to help with the cleanup. "It was a very fast recovery," Ostler said. "The factors were the unions, the cost, and the city ordinances that covered the buildings and what goes in them. And people were more for helping each other. Today, it's what politics you belong to." The commemoration of the 100th anniversary of the Great Chelsea Fire of 1908 will take place at the Chelsea Public Library, 569 Broadway, from noon to 4 p.m. on Saturday. For more information, call 617-466-4350.